Rise of Planet of the Apes has a very difficult road to travel. Is it a prequel to the original Planet of the Apes or a first of an independent series of its own? 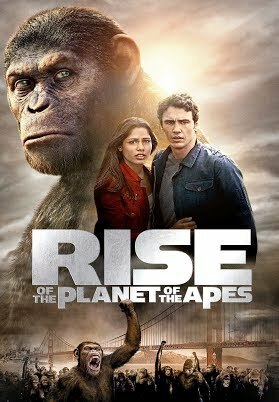 Well, judging from the final product itself, it appears to be both, and while Rise of Planet of the Apes is certainly a fun picture, I can't quite see it as an Ape picture. 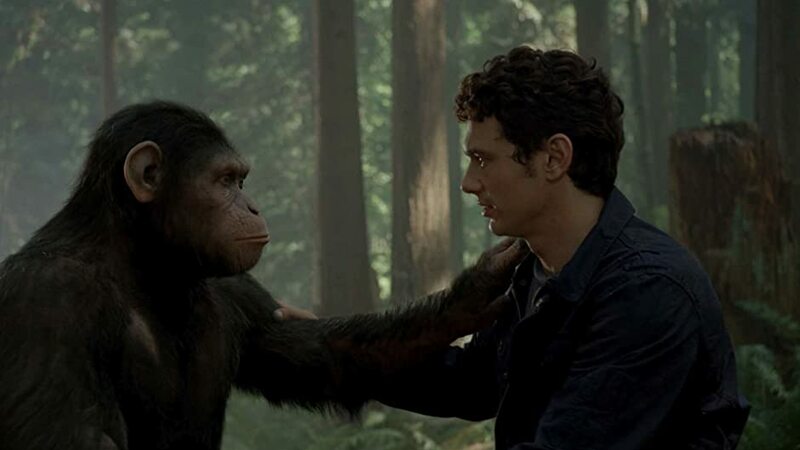 Will Rodman (James Franco) is close to finding a cure for Alzheimer's Disease thanks to tests performed on chimps, specifically one called Bright-Eyes. Just as Will is about to convince the board of Gen-Sys Corporation to up the funding, Bright-Eyes literally crashes the presentation, showing the downside of Will's new drug...or so we think. Actually, she was merely being protective of her newborn chimp. Board director Steven Jacobs (David Oyelowo) orders all the chimps exterminated, but the baby chimp is smuggled out by Will's assistant Franklin (Tyler Labine). Will, convinced his new drug will work with a bit of fine-tuning, continues his experiments on the baby chimp. It is important to Will that it work because his own father, Charles (John Lithgow) is suffering from Alzheimer's. Three years later, the drug works wonders: Dad regains his cognitive skills and the chimp, now named Caesar (Andy Serkis in motion-capture animation) shows intelligence higher than any chimp has ever possessed. As Caesar grows up and has a command of American Sign Language, an accident, brings them to zoo veterinarian Caroline (Freida Pinto). Within five years time, Caesar is an adult chimp, Will and Caroline are in love, and Charles has a new lease on life until Will discovers to his horror that the drug's effects are not permanent. Charles slips back into dementia and causes an accident which sparks his neighbor's wrath. Caesar literally leaps to Charles's defense, but this only brings animal control and Caesar is taken to a primate shelter run by John Landon (Brian Cox) and his son, Dodge (Tom Felton). This place is horrible for Caesar: he is treated inhumanely especially by Dodge Landon and is beaten up by other apes. However, using his intelligence, Caesar soon takes over the facility, waiting for the right time to take revenge on his abusers and return to Will and Caroline. Will, for his part, continues work on his drug, and finds a more powerful formula. The tests are proving so successful that Jacobs gives it top priority, even after Will discovers the drug will kill humans but not apes. Caesar has finally taken one beating too many by Dodge, and does what has never been done before: he speaks, crying "NO!" when Dodge attempts to beat him again. Now, Caesar rallies all the other apes to escape the facility and thus begins the Conquest of the Planet of the Apes...an epic battle between man and beast over the Golden Gate Bridge. This is an interesting point of debate when it comes to Rise of Planet of the Apes: is it prequel or complete reboot to the Planet of the Apes franchise? Rick Jaffa and Amanda Silver's screenplay can be interpreted either way. On the "prequel" side the film hints at certain elements that leave it open to it taking place before the original Planet of the Apes (a spaceship that is headlined as "Lost in Space" could be the ship that would eventually crash on the Planet of Apes). On the "reboot" side the film totally ignores the storyline set up from Beneath Planet of the Apes onward. Therefore, while Rise of the Planet of the Apes has elements of the Ape series, its divergence from major elements of the established storyline make it more a reboot. Let's leave that aside for the moment and focus on the film itself. Rise of Planet of the Apes is exciting with a lot of good action scenes (once the ape rebellion begins, the film doesn't lose its almost breathless pacing). The credit for that is in Rupert Wyatt's directing: he did well in the action scenes. Where the story went a bit wrong is in two places: people and in-jokes. If you are going to start a new Apes franchise (as Rise appears to be doing), it makes it hard when you have so many references to the original Planet of the Apes. When Caesar is first taken to the primate facility, the evil Dodge Landon (the name itself a reference to two characters in the first film) taunts all the other apes, then as the camera pulls away, we can hear him shout, "It's a madhouse! A MADHOUSE!" again, referencing one of the more memorable lines from Planet of the Apes. Granted, I laughed, but my best friend and I, having seen the original, were the only ones laughing. This leads me to think that the rest of the audience haven't seen the original and thus didn't get the reference. Two of his fellow chimps were named Cornilia and Maurice (which suggests references to original character Cornelius and the actor who played Dr. Zaius--Maurice Evans). By the time we got another version of the iconic "Take your stinkin' paws off me..." line (and even a virtual Charlton Heston cameo), the references were all becoming a bit too distracting and a too cute for their own good. The second flaw I found in Rise of Planet of the Apes is in the human element. We didn't get to know the characters well because a lot of time was devoted to building the revolution. For example, we know Dodge was cruel to the apes, but we never got why he had such a hatred for the animals in his care. Worse was Caroline, who didn't add anything to the film except a romance that never appeared to be part of the story of how the apes came to decide in all-out war against humans. We can actually expand this to the apes: while we know that Caesar and the other apes were mistreated by the Landons, what was the motivation for all the other apes to rise up in rebellion? One can ask how the apes gained intelligence almost equal to Caesar's at such a fast rate. The flatness of the characters extends to the performances. Almost all the characters in Rise of Planet of the Apes played just one emotion: Dodge was always angry, Jacobs always greedy, Caroline was always pretty, the Reardon's neighbor (David Hewlett) was always angry (to the point where it was becoming comical). Pinto suffered the most out of the script's lack of human interest: she was just there. It's not so much that the performances were bad as they were underwritten (though props to Felton for handling an American accent well, although maybe he should stay away from being the bad guy in films for a while). The better performance (human character) came from Lithgow. The scenes with him and Franco as father and son played beautifully (making their final scene rather sad and touching). It is unfortunate that he doesn't make it to the closing credits, given how his story of a man who is restored to life only to see it cruelly snatched away is more interesting than the 'love story' between Will and Caroline (although it is reminiscent of the Flowers for Algernon adaptation Charlie). Franco doesn't quite pull of the "scientific genius" aspect of Will, but he did show himself better when playing the concerned son. Granted, this plot element wasn't the most original in Rise of Planet of the Apes, but it gives us the required motivation for Will's unethical and illegal actions. This is the time to single out the best performance (non-human character): Andy Serkis' Caesar. Serkis is now the go-to man when it comes to motion-capture performances, and he has the movements of a chimp down perfectly, but he also makes Caesar a sympathetic character though at times, a bit frightening in how he looks: menacing when he isn't suppose to be. I'd vote him a special Oscar for continuing to give great performances without being able to be seen (as when he played Gollum in The Lord of the Rings: The Two Towers and Return of the King). Now, Rise of Planet of the Apes doesn't strictly leave the door open for a sequel (though a brief scene after the credits start does hint at the future of humanity) but it doesn't close the door to one either. I do find fault in that once the revolution begins it doesn't appear to have a grand strategy in overthrowing mankind, more of a 'leave us in peace' ending. Still, the final third of the film is exciting, with genuine moments of tension and even tenderness that almost make up for how the first two thirds both move slowly in the human story of the film and fast in the ape story. It is entertaining but in retrospect there isn't a great deal of monkey business in it.